I honestly think I need THIS. I'm so clueless when it comes to make up and beauty products! In fact, I've been sporting an Au Naturelle look even at work for 3 years! Modesty aside, thank God for good genes and clear skin that I somehow manage to always get away with it. My definition of putting on make up involves swiping some blush on my cheeks and glossing my lips up with my ever reliable strawberry lip gloss from Body Shop that is only when I remember to do so or if I have to go to an event that needs me to be a little more dressed up. 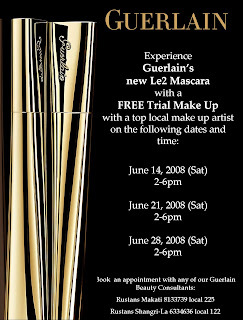 Thanks to YSL and Guerlain who'll be hosting a couple of Trial Make Up sessions with top local make up artists :) It's never to late to learn! See you there!